Outgoing mayor councillor Linda Wallraven presents a cheque to Seaford Down’s Syndrome and Special Needs Support Group. Pictured here (left to right): Outgoing Mayor Councillor Linda Wallraven, Claire Waterland and Dionne Davies of Seaford Down’s Syndrome and Special Needs Support Group and new Mayor Anthony White. On the 20th of June at the Seaford Town Council offices, outgoing Mayor Councillor Linda Wallraven presented a cheque to the Seaford Down’s Syndrome and Special Needs Support Group. 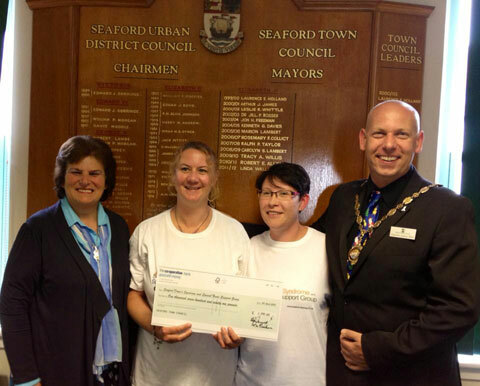 The money was raised by Councillor Linda during her tenure as Seaford Mayor. We are delighted to have the continued support of the new Mayor of Seaford, Anthony White, as he has chosen us to be his Charity of the year again, along with Waifs and Strays. A big thank you to Councillor Linda Wallraven for all her support and a big hello and thank you to new Mayor Anthony White for choosing us as his Charity for this year.